If you are into Graffiti and Streetart and fond of the odd drink or two then this might be right up your street! 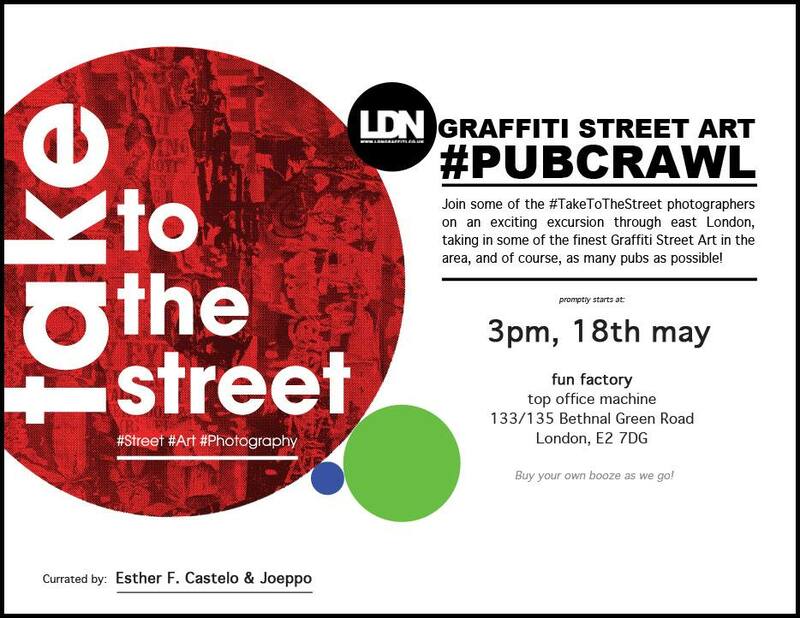 As part of the Take To The Street photographic exhibition (featured here) which is currently running at the Fun Factory pop up space at Top Office Machines space in East London, a Graffiti Street art walking tour/ pub crawl with some of the exhibiting photographers is planned for this weekend. The Take To The Street exhibition opened earlier this month to a pack out crowd with over 300 plus people attending the launch of the exhibition, we are not sure if the Pub crawl will attract such a large crowd but if you plan on going we suggest you get yourself along early as they will leave the venue at 3pm sharp! London street art tours are great things to go on and definitely something I would recommend.